Farmers and geeks don’t tend to move in the same circles, but they are the popular faces of two of the hottest industries for new careers. Independently and together, Dr Mitchell Welch of the University of New England (UNE) says, agriculture and the computer sciences are offering exceptional prospects for graduates. Agriculture, the essential business of feeding and clothing a burgeoning human population, is one of the fastest-growing areas for careers. Jobs specialists SEEK reported in mid-2016 that job vacancies in its ‘Farming, Animals and Conservation’ category had jumped 31 per cent year-on-year, the fastest growth in any sector it tracks. There are ample vacancies for computer science graduates, too, and in roles that come with substantial renumeration. Recruitment consultancy Robert Walters has forecast that renumeration on some IT jobs will jump tens of thousands of dollars this year, especially for roles that protect organisations from cyberattack, build better relationships with customers, or extract useful information from data. UNE’s Computer Science department is using the science of software development to change the way that farmers work with livestock genetics. The chromosome is famously complex and opaque to untrained people, and its secrets are extracted through intensive statistical analysis. To improve use of genetic information in sheep breeding, the Sheep Cooperative Research Centre (Sheep CRC), also based at UNE, decided that while it is impossible to reduce the complexity of the sheep genome, it was entirely possible to simplify the user interface – just as the 2007 iPhone put a simple user interface on a range of complex handheld technologies. The resulting app, RamSelect, gives ram buyers a user-friendly graphical user interface that allows them to interrogate the complex underlying data in just a few clicks, and get back a clear listing of the rams genetically best suited to their ewe flock. Prof. Kwan said this interface, and its results, are being refined in an ongoing collaboration between the Sheep CRC and UNE’s Computer Science in the School of Science and Technology. 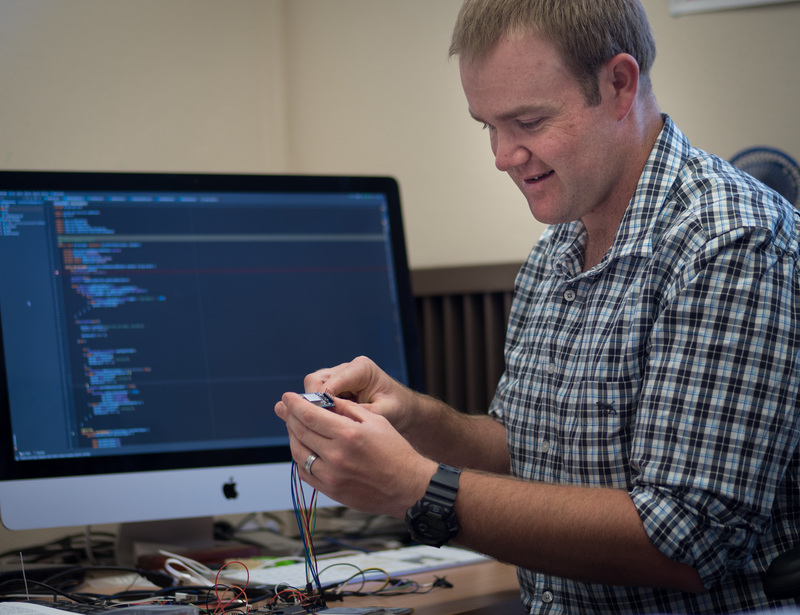 Similarly, Dr Welch is working with UNE’s Precision Agriculture Research Group to engineer and code instruments which, attached to sheep or cattle, could help introduce “precision grazing” by tracking animal movements across plant and soil types. By analysing the resulting data, farmers might gain a better picture of which areas of their property is being grazed, and why, and how to lift the productivity of less grazed areas. “The interface between agriculture and technology is especially important, given that it is the basis of human life,” Dr Welch said. UNE’s Computer Science program, with its strong focus on app development and data science, is producing graduates that are in high demand in this competitive environment, Dr Welch added.